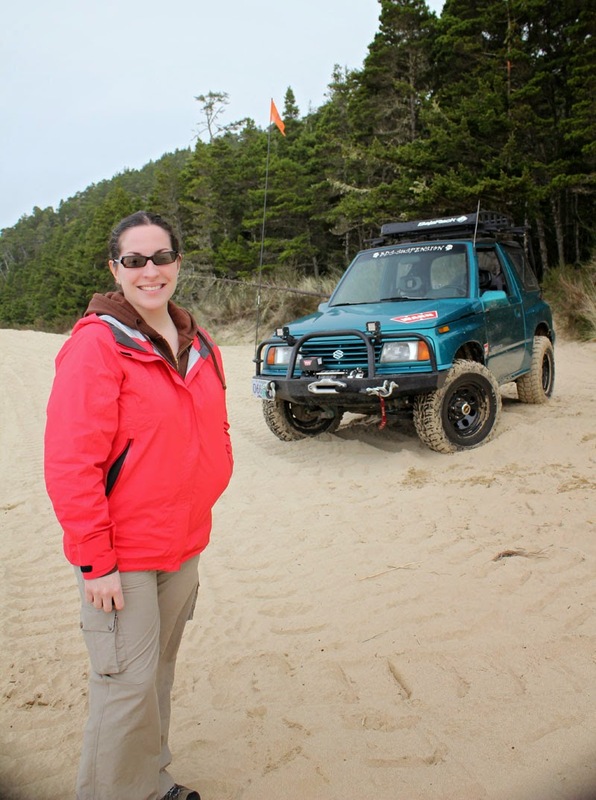 Last weekend my wife and fellow Subcompact Culture writer, Mercedes, and I headed out in the "Teal Terror" to drive the dunes at Oregon Dunes National Recreation Area in Winchester Bay, Oregon and explore the scenic Oregon Coast. The dunes, located just outside of Winchester Bay are significantly larger than the Sand Lake Recreational Area dunes outside of Pacific City, Oregon. Plus, the sand seems finer. Those two factors mean more challenges for our Suzuki. I'd been to these dunes before, but I was driving a Kawasaki Teryx4 UTV—a lighter and more nimble form of sand transportation. 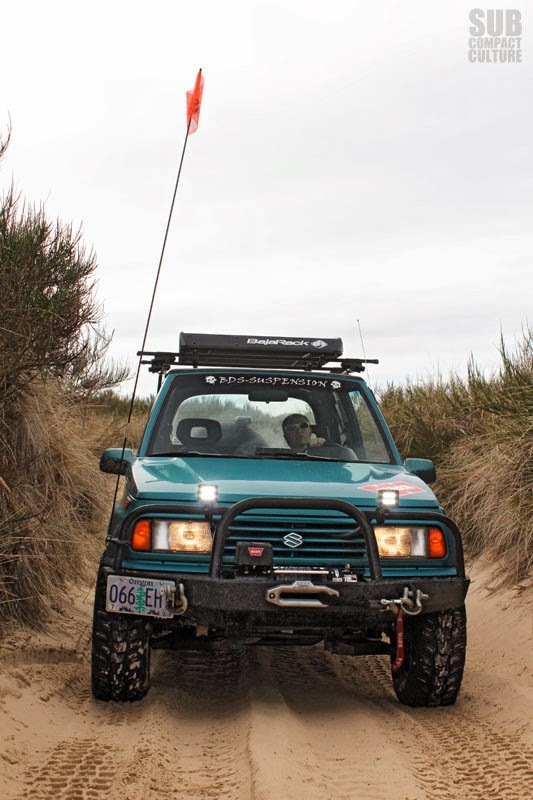 And while my Sidekick is pretty light for what it is, with only 95 horsepower at the flywheel (when the trucklet was new) and soft sand, I didn't try to tackle the taller, steeper dunes. That didn't mean we didn't find challenges here and there. This photo above doesn't do it any justice: this smallish incline proved to be more difficult than we expected. It took a few runs at it to make it to the top. The key is momentum, and plenty of it. However, you don't want to hit the initial incline too hard, or you can get a serious jolt downwards. We attempted a number of hills that were challenging. There were a couple we didn't make it over, but trying is half the fun. Being a small vehicle, we were, however, able to have a lot of fun around the area's perimeter, which is often times only accessible by ATV/UTV due to the trails' narrow widths. Our rig's diminutive size let us play in some of these twisting, winding culverts in the grassy areas. Some of these trails have very angled, off-camber areas that have been scooped out by UTVs or ATVs, but the Sidekick handled them like a champ. The truck did far better than I would've initially expected. Then again, it's not much larger than a UTV. At one point we ended up on an extremely narrow trail that lead through some very close-in trees. Even on an ATV it would be tight and low, and for the Sidekick, it became close quarters—too close. 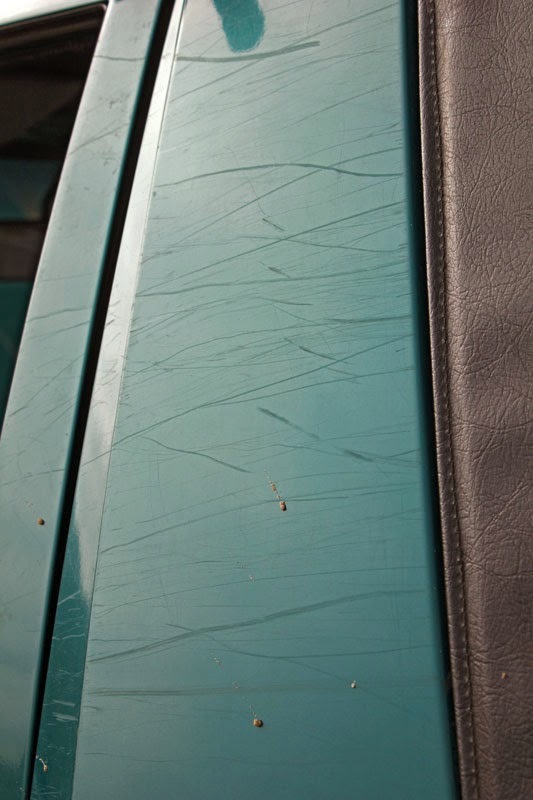 At one point, we ended up having tree branches scrape mercilessly against the truck's teal finish. And while I'm not all that concerned about the truck's patina, I'd much rather not add to it if I don't have to. At one point, I thought the tree branches were going to rip the soft top as they clawed the side windows. Plus they were fairly large in diameter. Clearly, this was not where we wanted to be. But we had to get out, so we pushed forward. Adding to the complication was the roof rack, which was only causing more problems as it brushed against tree branches and such. In fact, part of the Thule rack mount's feet got ripped of. Luckily, we were able to find it as we ventured back on foot to retrieve it. Even more amazing is the fact that we actually found the piece, which was laying off to the side in some grass. And so what did the damage look like afterwards? The entire car pretty much looks like this on both sides. I think much of it will buff out. 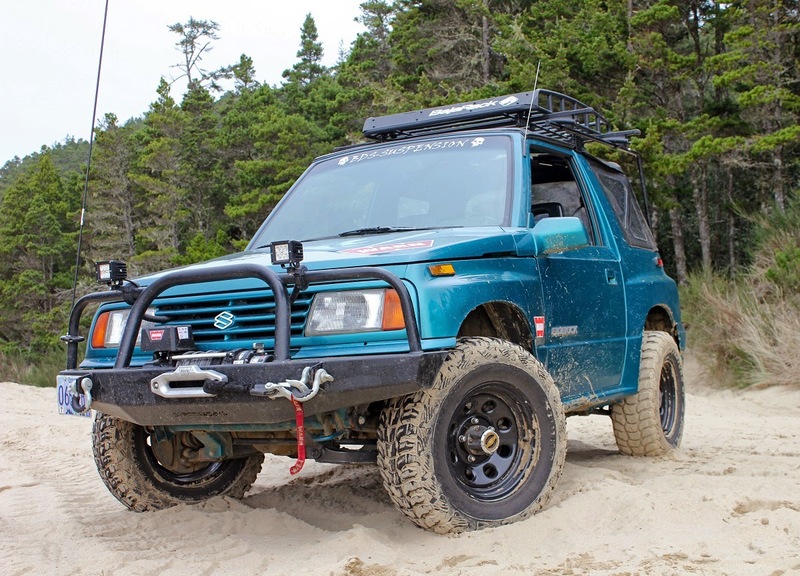 But no worries—I bought the Teal Terror with the intention to take it off road and to explore. So a few scratches will only add character and allow for stories around the campfire. 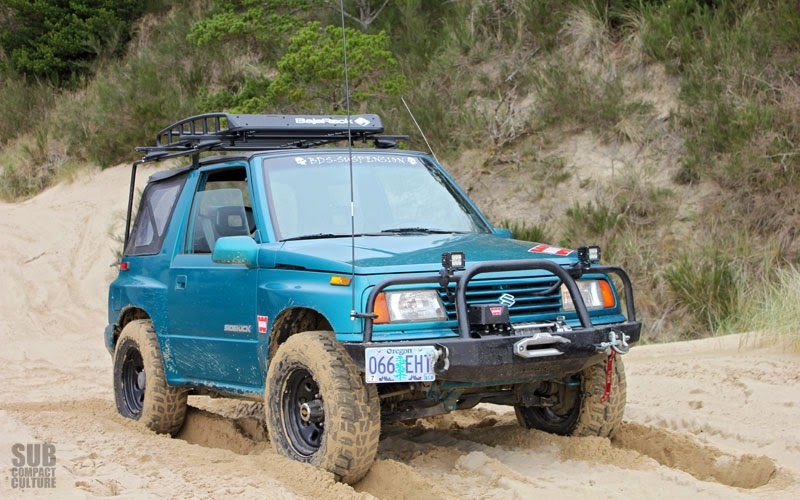 We kicked up some sand, drove some fun trails, made (and didn't make) some challenging ascents, and picked up a few character marks along the way. I'd say overall, it was a great day at the dunes. 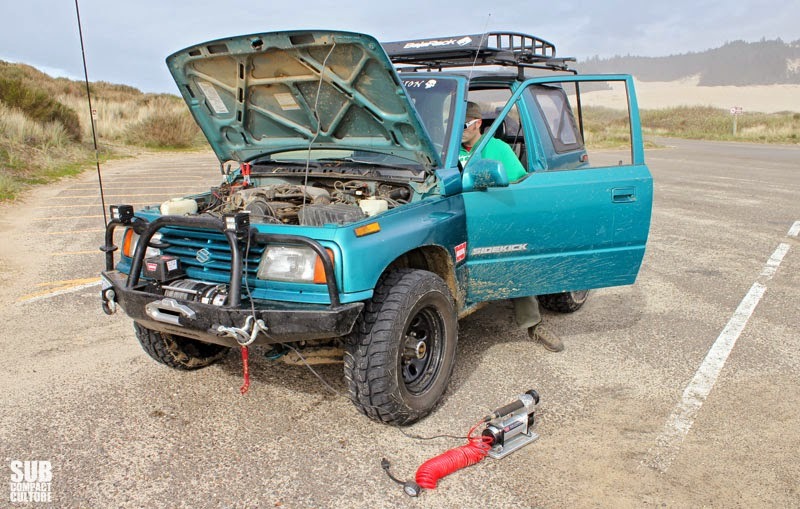 All that was left was to air up the tires with our little compressor and hit the road. Well, at least go for a beer. 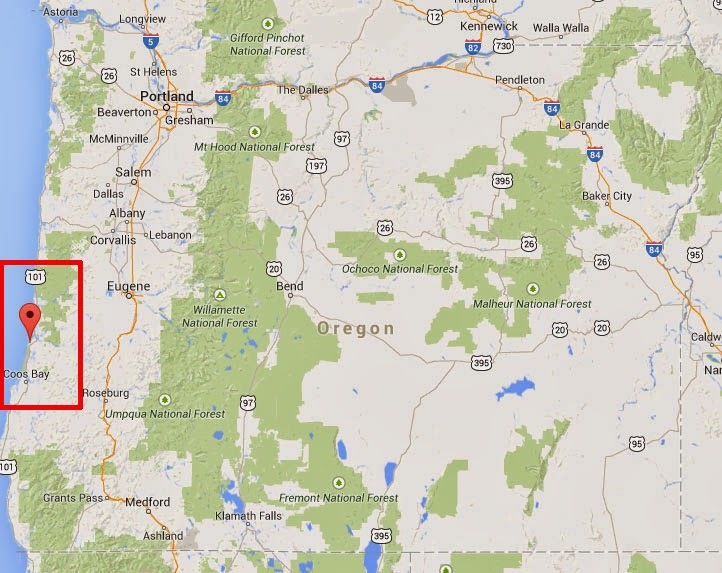 We stayed the night in the tiny town of Reedsport, population 4,111. There we happened upon another vehicle out exploring, although on a much larger scale. This massive overland travel rig is a Bocklet Dakar 860F. 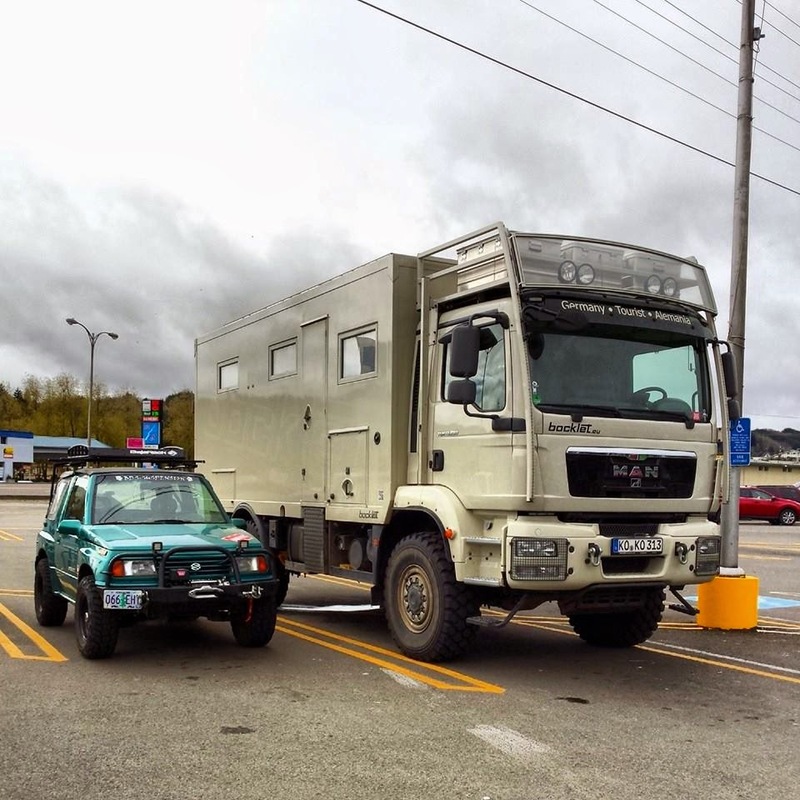 It really does look like one of the MAN racing rigs you'd see in the Dakar rally, and it absolutely, positively dwarfed our Suzuki. And while it's anything but a subcompact vehicle, it is a subcompact house. You can see more pics of this behemoth on Bocklet's website. The German Bocklet attracted all sorts of attention. Passersby took video. People (including ourselves) posed with it for pictures. We waited around hoping to meet the owners, all while dreaming of strapping the Sidekick to the back and hitting the open road. Unfortunately, we never got a chance to meet the travelers. According to the map on the truck's rear, it had come from Europe, went through Canada, up to the Arctic Ocean, and was headed West or possibly South; we weren't sure, as the map hadn't been updated. Dinner that night was at a local joint that had amazing ribs, great sea food, plentiful beer, and amazing cookies. If you're ever in Reedsport, check out the Harbor Light Restaurant; it's the best joint in town. We finished the night off with a beer growler fill at the Recreation Station, a gas station with about eight taps of microbrew. It was back to our hotel room for some much needed vegging out. The next day, it was time for the trip back to Portland. We did breakfast back at the Harbor Light (which was equally amazing), and decided to take it slowly back home. We took back roads whenever possible, leaving the semi-familiar HWY 101 for others. Some of the roads we found went for miles on gravel. It's always interesting to get off the main drag and see how people live, get a flavor for the countryside, and to see the sights, sounds, and smells along the way. It reminded me how much I loved the idea that it's not the destination, but the journey—something that was instilled in me by my mother, who took us on road trips quite frequently while growing up. While we may only have been able to get out for a weekend, we both felt rejuvenated. It also gave us the desire to start planning for more trips. Some of which might only be for a weekend, others that might take much longer. Hopefully we'll be able to get out again soon, whether it's in the Teal Terror or one of our other vehicles. We're looking forward to the next trip.